Mardi Gras is next week! Get those beads out and fire up the stove to make some jambalaya! A few years ago I made a big, traditional king cake. This year, I wanted something more simple. 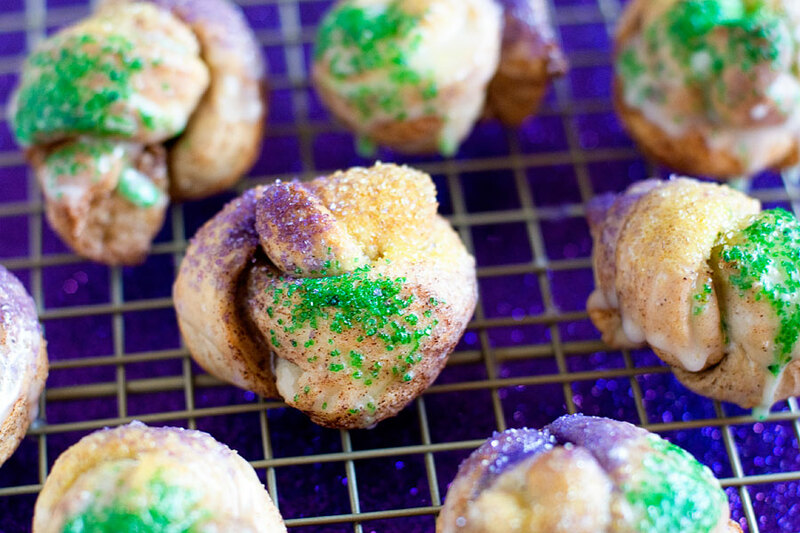 Pinterest pointed me in the direction of these simple king cake knots, which are made using store-bought refrigerated dough. Check back in the coming days, as I also have a post for king cake monkey bread! 1. Preheat oven to 350F. Unroll French bread dough into a large rectangle, about 16 x 12 inches. Brush the dough lightly with softened butter. Mix together sugar and cinnamon and sprinkle over butter. 2. Cut the dough in half lengthwise and then cut crosswise into strips, about 1-1/4 inches wide. Tie each strip into a knot and place on baking sheet. Bake for 25-28 minutes. Cool on a wire rack. 3. Mix together powdered sugar, milk, and vanilla. Dip each knot into icing and decorate with sprinkles.